Although they became a band as early as 2012, Fifth Harmony had never released a full length album until last night. 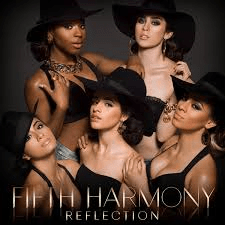 Without an album, however, Fifth Harmony gained great recognition through being contestants on X Factor in 2012 and even winning an MTV Video Music Award in 2014. The full length album, titled “Reflection,” is now streaming on iTunes for free, as “Stream Reflection On ITunes” quickly became a trending topic on social media. The album features a variety of songs ranging from pop to R&B, with the album having a much more urban vibe than their previous EP. The first song “Top Down” creates a fun and energetic vibe, as it includes a very up-tempo beat. This introduces the entire vibe of the album, which develops into a female anthem project. “Boss” was their first single from the album, and has a very urban sound as they rap half the song, while adding a catchy chorus with an R&B feel to it. This single has also been certified gold. “Sledgehammer” was the second single, and is a straight pop anthem, that again has a very catchy chorus and is a very fun song. This single made it to the top 40 on Billboard, and is the group’s highest charting song. “Worth it” and “Like Mariah” are more R&B, with “Worth It” featuring rapper Kid Ink, and “Like Mariah” featuring rapper Tyga. “This is How we Roll,” “Reflection” and “Them Girls be Like” are the more female anthems of the album, talking about hanging out with friends and the daily interactions of females. “Reflection” and “Sugar Mama” are the more flirtatious and teasing tracks on the album, as they are playful songs that are not intended to be taken too seriously. “Everlasting Love” is the most romantic and R&B song on the album, as the entire track involves the girls confessing how much the love the person of interest. Lastly, “We Know” is an empowering song about the girls choosing to not fall for a boy and all of his games, but instead choosing to listen to each other’s advice, and stick together as friends. The album can be currently be pre-ordered on iTunes, and officially purchased on February 3rd of this year. However, if you want an idea of how the album sounds, a link can be found believe to listen to the streaming album for free through iTunes. This project is a great debut for Fifth Harmony, and you should definitely check it out!